Home Job Tips Job Interview Tips | Must Know This - What are the trickiest questions that tech companies will ask in a job interview? 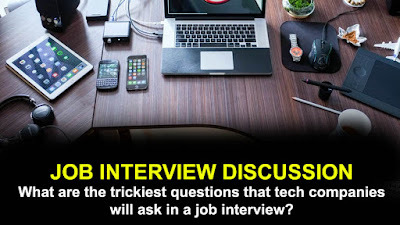 Job Interview Tips | Must Know This - What are the trickiest questions that tech companies will ask in a job interview? Must Know This - What are the trickiest questions that tech companies will ask in a job interview? For a programming position? They might well ask you to write some code to solve a particular problem. They could ask how a particular technology works, ask what your computer does when you turn it on or when you go to a web page, or ask how to debug a problem where data is being lost between a client and a server. Pretty much any kind of question would be fair game. Part of it depends on what kind of job is being applied for. Even if we assume it's a programming position, there's going to be quite a difference between an architect position and an internship. Puzzle questions used to be in vogue, but have now (thankfully) largely fallen out of favor. They're fun, but they're terrible for assessing candidates. There are other kinds of questions that I'm not a fan of, like the stress test (there are no right answers, and they just put pressure on you to see what you'll do) and certain questions that have a "right" answer known only to the interviewer. ("Which would you rather be able to do: fly or turn invisible? (He said 'Turn invisible,' so is clearly untrustworthy.)") Really, the takeaway is that you shouldn't worry about what the trickiest question is. Get an interview prep book, like Cracking the Code Interview and look through some of the common question types. Make sure you're ready for the soft skills questions: "What would you do if you disagreed with a teammate? ", "Name a time you showed leadership on a project," and the ugly "What is your greatest weakness?"